Here at Dental Studio we ensure that all dentures are hand-crafted by our technicians to fit the contours of your mouth perfectly giving you dentures that are not only comfortable but that also look great and that you can eat confidently with. Tooth loss can occur due to dental decay, gum disease or an accident or injury, but the results are almost always impaired mouth function and smile aesthetics. Dentures are a cost-effective way to restore missing teeth and restore damaged smiles, able to fill in several tooth gaps or replace a full set of teeth. These are used when a full set of teeth are missing and can be combined with dental implants for added stability. Complete dentures are able to replace an arch of teeth and will be custom-made to sit comfortably within your mouth. They provide patients with the renewed ability to eat and talk comfortably. Partial dentures can be used if you are missing several teeth. They use clasps or attachments placed on the remaining teeth for added stability. You will always be included in the design and creation of your partial dentures and asked to decide on the colour and shape of your new teeth. Each set of dentures are custom-fitted to your oral condition and made using the finest materials. This ensures that your teeth are natural looking. 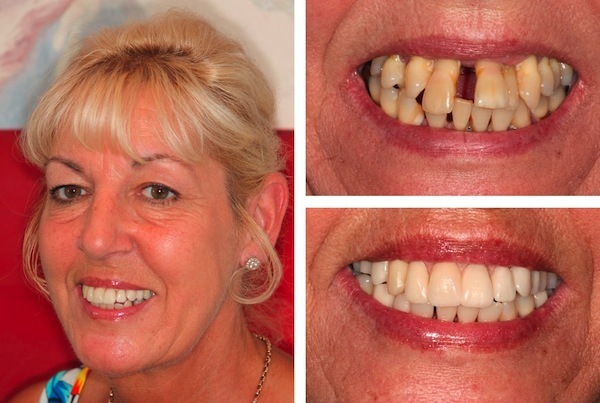 Once your dentures have been made and fitted you will see an instant transformation in how you smile, talk and eat. Denture wearers can look years younger after treatment is complete.